OMG Mustard compresses for her eyes! That’s just so terrible! She had a gift and I’m glad that she used it. 8,000 hymns is no small feat! In literature I would think 8,000 of anything would be a multitude of discovery and events. I found it ironic, at best, a person being blind and taking authorship of even one piece of literature might be construed as amazing…. 8,000? unbelievable. There truly is a God I would think. 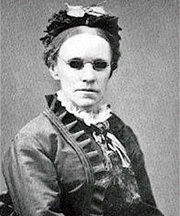 Fanny Crosby lived her life as a faithful servant of God, an inspiration to us all, and went to her eternal reward on Feb 12, 1915.